Do you struggle to think positively? God’s biggest gift to us is a hope and a future with Him. No matter what happens on this earth, Believers are promised the presence and help of our mighty God and Savior. We’re promised eternal joy with Him! That alone should help us to look at life from a positive perspective. 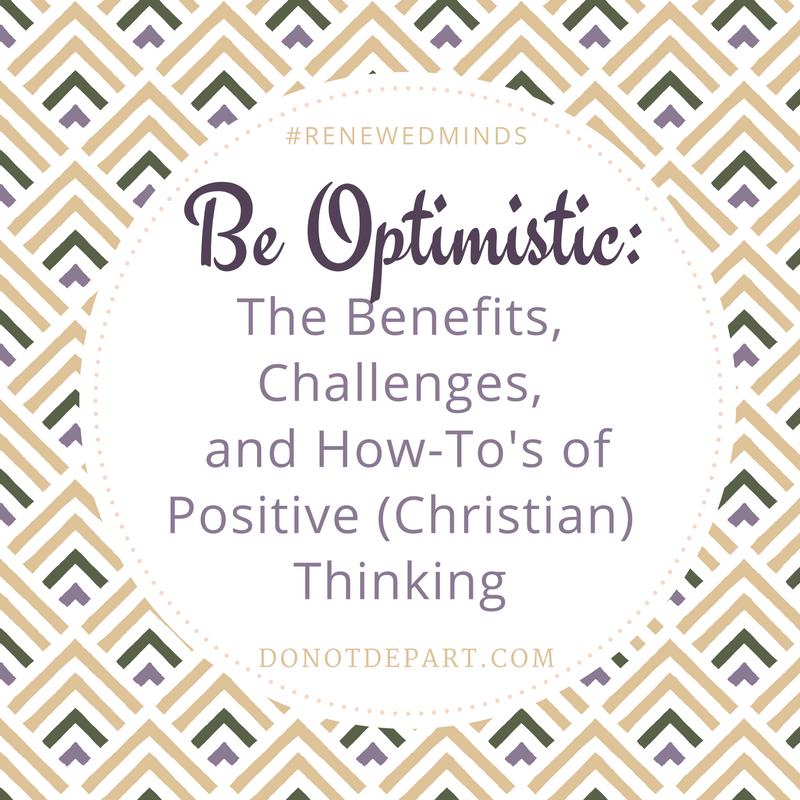 Christian optimism goes deeper than putting on the proverbial “rose colored glasses.” It’s renewing the mind to look at life through the lens of Christ’s victory! Jesus tells us to imitate Him. Though Christ was very realistic and gave stern warnings about sin, Satan, and Hell, admonitions against pharisaical hypocrisy, and firm guidance for His disciples and followers, He was also very optimistic. He knew the potential of His message. He knew and understood the power of Father God and the saving power of His own blood. He looked forward with eager expectation to future hope and tells us to do the same. “No Christian should be a pessimist. We should be realists—focused on the actuality that we serve a sovereign and gracious God. Because of the reality of Christ’s atoning sacrifice and His promises, biblical realism is, ultimately, optimism.” -Randy Alcorn, see more here. We too should have great faith in God’s power, ability, and goodness. Made as a choice over pessimism, optimism is an expression of the joy borne of faith, and repels doubting. When our minds are focused on God’s nature and the hope-filled truths of His word, we have no reason to wallow in pessimism. Don’t you love Randy Alcorn’s words? I pray that if you’re struggling with pessimistic thoughts and attitudes, this post might encourage and bless you. A little further down in the post you’ll see a list of 5 tips to help change our mindsets. Let me know in the comments here or over at DoNotDepart how God is drawing your heart toward optimistic thinking. Remember, focusing on God’s nature and the truths in His word are both life and mind changing!